About F. N. Cuthbert, Inc. Available in port sizes ¼, 3/8 and ½ the 652 Series features one of the highest flow characteristics of any FRL on the market, compared to its size resulting in a lower pressure drop. A lower pressure drop can deliver savings in energy consumption. The robust corrosion resistant construction, a temperature range of -40° C to 80° C and a broad range of options such as ATEX and CU-TR makes the 652 suitable for many uses, including those in harsh environments. Typical applications include industrial automation, process industries, breathing air, food packaging and paint spraying. 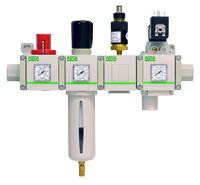 The Modulair Filter, regulator and lubricator systems are robust, offer a high flow rate compared to their size and have many options and accessories. Available in port sizes 1/8 – 1 1/2, the various components can be combined into a single unit for the control and treatment of pneumatic air. The numerous options include ATEX certification, key-lockable regulators, automatic and semi-automatic condensate drains and various filtering and mounting options. The units can be assembled into rigid piping networks without the need of additional supports. Delta 901 Series™ filters are a range of premium filtration products for applications where a high flow rate is required. Available in sizes ¼ to 3, the Delta 901 Series can be used in many applications including industrial, process and medical, and are perfectly suited for compressor applications. The standard aluminum end caps on every element, premium manual drain, seals made of Fluorocarbon (FKM), and available 3 micron internal pleated prefilter sets the Delta 901 Series apart from the competition. The R80 series precision regulators are available for instrument or industrial applications requiring very accurate, repeatable control of the downstream pressure. Available in sizes ¼ to ½ the R80 series will react to downstream pressure fluctuations as small as 0,7 mbar thanks to a finely tuned stainless steel volume capsule. The 342 stainless steel filter, regulator and filter regulator is suitable for corrosive and potentially explosive environments. Ideally suited for harsh environments, such as offshore, the body, bonnet and internal metal parts are all manufactured in stainless steel according to ASTM A351/NACE MR 01.75. and elastomers are in low temperature FPM. Lockout and shut off valves prevent unauthorised pressurisation of an air system during service or maintenance. Copyright Valve-Warehouse.net - ASCO Solenoid Valves From F. N. Cuthbert Inc.. All Rights Reserved. eCommerce Software by 3dcart.